As your army grows, each of these expansions gives you a different way to grow the forces of the Daqan Lords or Waiqar the Undying. 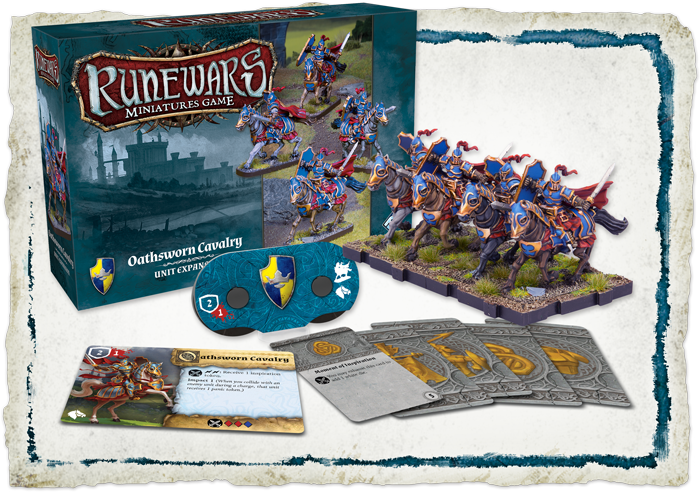 The two unit expansions contain enough figures to field a unit of Oathsworn Cavalry or Reanimate Archers, identical to the units in the Runewars Core Set, but offering new upgrade cards and allowing you to field larger armies on the battlefield. 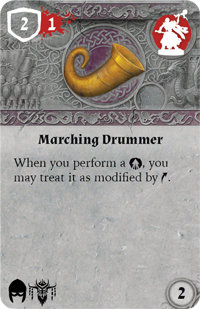 Then, you can increase your command over the forces of Terrinoth or the undead with two unit upgrade expansions. Each unit upgrade expansion offers a wealth of upgrade cards and four figures that can be added to an infantry formation to greatly increase that unit’s power. With the Oathsworn Cavalry Unit Expansion, you gain four new Oathsworn Cavalry figures—enough to field a two-tray unit or increase the size of another unit. These fearsome knights are sworn to fight for the Daqan Lords and protect the realm, and they are first introduced in the Runewars Core Set. We’ll take a closer look at these cavalry in our preview of the Daqan Lords forces, but this unit expansion is a perfect way to quickly increase your cavalry and unlock new options with five new upgrade cards for any army. With polished armor glinting in the sunlight, the armies of the twelve baronies and the Free Cities are a stirring sight. Master wizards from the circles at Greyhaven and Nerekhall bolster their ranks, wielding destructive power and an arsenal of runebound shards to devastate their foes. Battle standards with histories as long as the Baronies of Daqan swirl in the wind, while the roar of lion horns stiffens the backs of wavering soldiers. Every company is led by a champion, one who has faced death time and again, yet has survived and now invites others to draw strength from his own stolid bravery. 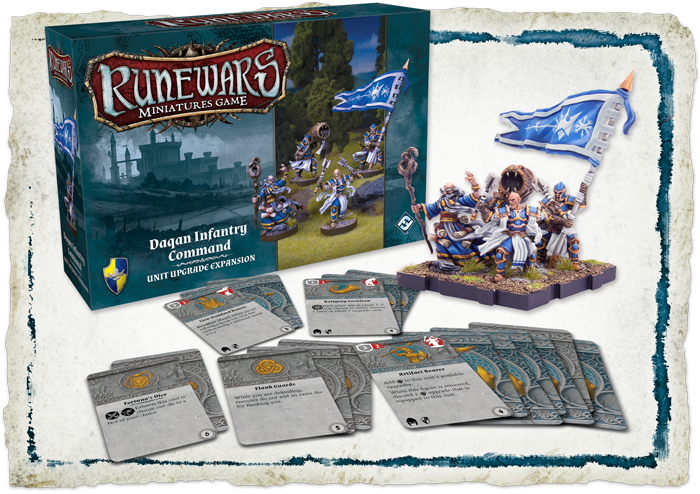 The Daqan Infantry Command Unit Upgrade Expansion introduces four brand-new figures to the armies of the Daqan Lords—a Banner Guard, a Wizard, a Champion, and a Cornicen. Alongside these figures, you’ll find eighteen new upgrade cards, many of which include ways to bring these new figures into your armies. 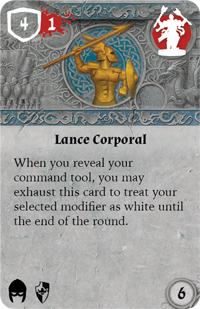 For instance, you may choose to support one of your units with the Lance Corporal upgrade card, implanting the Champion figure into the ranks of your unit. As long as the Champion figure is alive, you gain the benefit of the Lance Corporal card, which significantly boosts your tactical flexibility! We’ll take a closer look at this unit upgrade expansion in a future preview. Fire poisoned arrows down on your enemies with the eight new Reanimate Archer figures included in the Reanimate Archers Unit Expansion! These eight figures give you the option to field another two-tray unit or increase the size of a larger unit—perhaps fielding a block of archers that will rain death on your foes. 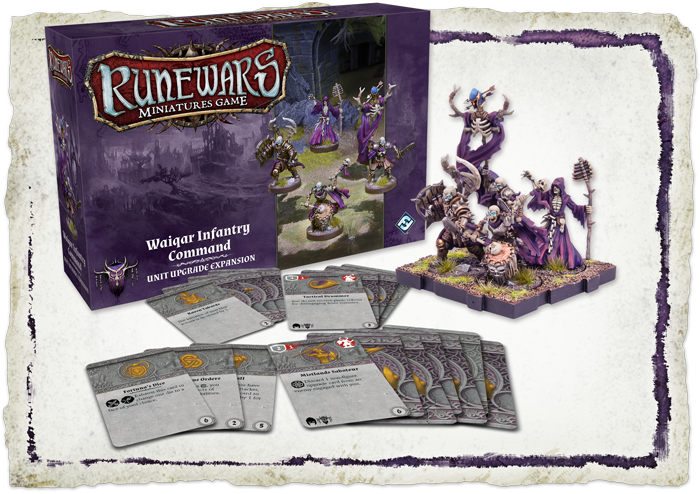 Like the Oathsworn Cavalry, these figures are identical to the figures included in the Runewars Core Set, and this expansion gives you an easy way to raise more undead to fight for Waiqar the Undying, while opening dark new paths with five new upgrade cards. 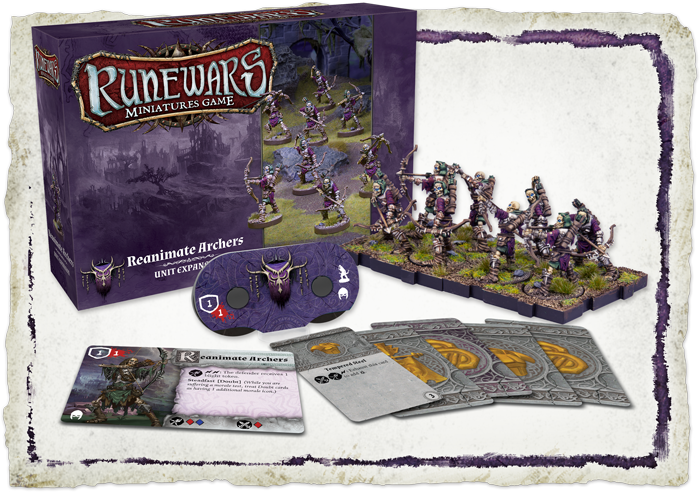 We’ll explore the Reanimate Archers in much more detail in our preview of Waiqar’s forces. We’ll take a closer look at this unit upgrade expansion in a future preview!